RobVogt80s: Alvis Satele: Remembering "Save Our Stamps"
but their very existence was in jeopardy. The 1985 season for the Calgary Stampeders would prove to be a pivotal one in their history. The Stampeders had finished 6-10 in 1984, dead last in the West Division. Things really could not get much worse going in to 1985. There was optimism before the season began as Calgary had signed quarterback Joe Barnes, who just two seasons earlier had helped the Toronto Argonauts to the Grey Cup championship, and was an all-star the next season in 1984. The Stampeders acquired him in a trade to bolster their chances. The optimism would not last. They started the season 0-5 and things really were not going that well, but there would be a moment of hope. It was in their sixth game of the season, It was a Saturday night, August 17, and they were playing the Lions at B.C. Place in Vancouver. It was a late start, 8:30 p.m. to be exact. The Lions had never lost to Calgary at B.C. Place, and they were one of the best teams in the league. The Stampeders had fired coach Steve Buratto and replaced him with Bud Riley (whose son Mike Riley would go on to coach Winnipeg to Grey Cup wins in 1988 and 1990). What unfolded was one of the best football games I had ever seen. My mom had come out of the bath and settled on the couch to watch with him. I found myself explaining the rules to her, and she caught on quickly. She got deeper into the game as it went on, and the Stampeders were hanging around. Joe Barnes was finally beginning to play like the quarterback they had acquired. Calgary led 6-3 after the first quarter and 16-11 at halftime. I was surprised at how well the Stamps were playing. They hung tough in the third quarter, leading 30-18 with just 15 minutes to go. I was hoping so hard they could hold on. The lions mounted a furious comeback with two touchdowns, but Calgary hung on for the 35-32 win. I thought it may be a turning point, but it was the one big bright spot of the season. The Lions would go on to finish 13-3, good enough for first place in the West, defeat Winnipeg in the West Final, and win the Grey Cup with a 37-24 win over Hamilton at Olympic Stadium in Montreal. Calgary would go on to win two more games, finishing 3-13 in the West, dead last and actually worse than the year before. No playoffs, no all-stars, not a lot to celebrate. More foreboding was the fact their eight home games at McMahon Stadium averaged 14,988 spectators, with a high of 18,303 and a low of 11,185. The team had lost money and talk began to surface about the team folding altogether. Things were desperate, so a group of community members, players and fans organized the "Save Our Stamps" campaign. The result was the sale of 22,400 season tickets and an injection of much-needed money. What I will always remember was in the winter of 1986 listen to, I think it was 1140 AM radio, and they played a song called, "When the going gets tough, Calgary gets going". It was set to the same music as another popular song of the time: "When the Going Gets Tough, The Tough Get Going" by Billy Ocean. His song was actually part of the soundtrack for the movie "The Jewel of the Nile", which was the sequel to "Romancing the Stone". After all the pleas to the community for support, the question now was: could they put a decent product on the field. The 1986 would be very important – maybe the most crucial in the team's history. The Stampeders hired Bob Vespaziani as their coach and general manager Earl Lunsford set about rebuilding the team. Once again, after a three-win season the previous year, there was no place to go but up. They opened their regular season at home against their arch-rival, the Edmonton Eskimos. The team that took the field had been completely re-tooled. There were players who had been with other teams, like defensive back Ken Miller and offensive lineman Kari Yli-Renko, and some new faces, like Marshall Toner. He was a Canadian receiver who had written a letter to every team in the CFL looking for a break. This is where linebacker Alvis Satele comes in. He was one of those players Lunsford brought on board to improve the Stampeders. 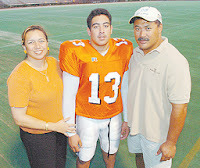 Alvis Satele was a graduate from the University of Hawaii who had spent some time with the Washington Redskins and San Diego Chargers before being released. The first time I saw him play was in that 1986 season opener against Edmonton. I was amazed at all the new names, and surprised at some of the players from other teams they had brought in. From the beginning, the Stampeders were a different team. Their defence dominated the Eskimos, and Satele even recovered a Milson Jones fumble in the third quarter. Calgary led throughout the game, but their old nemesis Matt Dunigan got them again, hitting Stephen Jones with a last-minute bomb to set up the game-winning score and pull out the 21-20 victory. To make matters worse, out of frustration over getting beaten deep by Jones, Miller punched him and got an unnecessary roughness penalty. Still, it signalled the Stampeders were for real. They would go on to have a huge turnaround, finishing 11-7 (that year the league went from 16 to 18 regular season games) tied for third in the West with Winnipeg, but finishing fourth based on a tie-breaker. That year the CFL changed the playoff format. If the fourth place team in one division had a better record than the third place team in the other division the team with better record made the playoffs. That year the West was much stronger so, the fourth-place Stampeders qualified. It mean first played fourth and second played third in the West, while the top two teams in the East played a two-game, total-point series. That meant a date with the Edmonton Eskimos at Commonwealth Stadium, where Edmonton won 27-18. The Eskimos would go on to win the West final 41-5 over BC, before being blown out in the Grey Cup by Hamilton by a score of 31-15.
high school at the time, and wife Lee Ann. Alvis played two seasons in Calgary and one in BC before his career ended. His statistics are not readily available. The only thing I could easily find was that in 1986 he had seven quarterback sacks and two fumble recoveries. He also shares the club record for most sacks in a game with four against Toronto on Oct. 13, 1986. 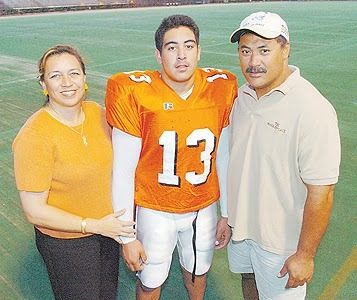 His son Brashton Satele followed his footsteps and played with the University of Hawaii, and has played in the pros with the New York Jets and Dallas Cowboys. He has three nephews who played pro too: Samson Satele plays with the Indianapolis Colts; Hercules Satele who played with the Arizona Cardinals; and Melila Purcell who played with the Cleveland Browns. More than anything, every time I hear the name Alvis Satele, I am reminded how close we all came to losing our Stampeders. Would that have made us Rider fans by default?